Due to unforeseen circumstances I now have one lovely female puppy available. 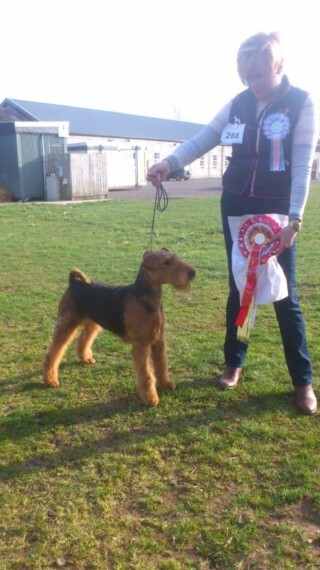 She is from top quality Show Champion sired health tested parents. Reared in the home so very well socialised. Bold and confident. Out of my own home bred girl Jazz. .Singretts Freedom. She has the most wonderful friendly personality. Has shown to Crufts level and is now enjoying life being a mum. I also have the Grandma to the litter here who can also be met. She comes with a folder full of information. Health tested. first and second vaccination. microchipped. wormed regularly. Fully weaned and independent from mum. 5 weeks insurance and bag of their food that they have been reared on. If you feel that you could offer her a loving home then feel free to call for further information. Come and meet us all and have a cup of tea and a play. No full time workers or new mums please as she will need her own time with you. If you have holidays booked. then i can accomodate her until you return.